Repairing Finish on a Danish Modern Table - Schoenbauer Furniture Service, Inc.
A hot pot damaged this Danish modern table. A: Sometimes, the white marks disappear in a week or so as the moisture evaporates. Gentle heat, such as from a hair dryer, can speed this process. It also sometimes works to smear mayonnaise on the spots and wait overnight. The combination of acid (lemon juice) and oil works wonders. If the marks persist, the moisture driven in by heat probably caused tiny cracks in the finish. Try polishing the crazed areas with a soft cloth moistened with a ring remover, such as Homax White Ring Remover ($4 at amazon.com) or Liberon Ring Remover ($21 at rockler.com). Ring removers contain very fine abrasives. And if polishing doesn’t work, you’re probably looking at stripping the finish and starting over, unless the finish is shellac. Test for that by dabbing a little-denatured alcohol onto an inconspicuous area and seeing whether the finish softens. If it does, you can probably use the alcohol to soften all the finish that’s turned white. Let that dry, then re-coat the tabletop with shellac. 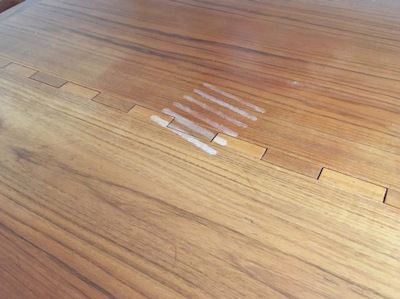 Companies that refinish tables include Schoenbauer Furniture Service in Charlotte Hall, Md. (800-955-7603; schoenbauer.com), which charges $30 to $50 a square foot to refinish a tabletop, and Restorations Unlimited in Sterling (703-904-9575; virginiafurniturerefinishing.com), where tabletop refinishing starts at $100 per foot of a table’s length (meaning at least $600 for a six-foot-long table). The company’s preferred finish is catalyzed lacquer, which is more resistant to heat damage than the other options.